Two-goal hero Jamie McGonigle says he will play anywhere the manager wants him to for the benefit for the team. The 20-year-old put on an impressive show at Ballinamallard on Saturdayscoring a brace from the wing as the Bannsiders ran out 3-0 winners. McGonigle showed his striking prowess with two clincical finishes, but he told Times Sport he is happy to play wherever Oran Kearney wants him to. “Wherever the manager wants you to play you just get on and do your job for the team, three points is the main thing,” he said. “The 4-5-1 formation seems to be working really well for us. parky scored the other goal today so it is certainly paying dividends. 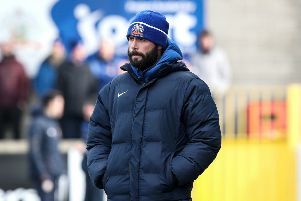 McGonigle believes the Bannsiders can push for honours this season. “We have bigger ambitions set for ourselves this season,” he said. “Everyone is still sickened by that semi final defeat to Ards last season. “We are determined to push on again this season. “The last few performances show the 4-0 defeat to Dungannon was merely a blip, we have to keep this run going now though.